There are so many books to be thankful for, but here are some of my favorites. 1. The Truth About Forever by Sarah Dessen - This is one of the first Sarah Dessen novels that I read that really resonated with me. It sparked my love for contemporary young adult literature. 2. Pride and Prejudice by Jane Austen - Thank you Ms. Austen for creating Mr. Darcy. Am I right? 3. Anne of Green Gables by L.M. Montgomery - Anne was probably the first female protagonist that really spoke to me as a child. I still love Anne to this day. 4. New and Selected Poems by Mary Oliver - I am not an avid reader of poetry, but I do love Mary Oliver. 5. The Summer I Turned Pretty by Jenny Han - I adore this entire series. This series just gets me. 6. To Kill a Mockingbird by Harper Lee - This is one of the few classics that really stuck out for me when I read it in school. 7. A Christmas Carol by Charles Dickens - This story will never get old for me. I read it in middle school and then taught it for many years to my middle school students. 8. Outlander by Diana Gabaldon - This book reminded me that adult sci-fi/romance can be just as powerful as a contemporary novel, if not more. Plus, Jamie Fraser. Need I say more? 9. Gone with the Wind by Margaret Mitchell - I gotta love me some Scarlett O'Hara. 10. The White Queen by Philippa Gregory - This novel reminded me that adult historical fiction can be fun, captivating, and more interesting than I thought. It definitely reignited my love for historical fiction. What books are you thankful for this holiday season? Let me know in the comments below. This meme is hosted by The Broke and The Bookish. Fantastic list Christina! Sadly for me the book that ignited my interest in YA fiction was Twilight (and the class on YA lit I was taking at the time where the teacher and most of the students were raving about the book). I think my list would include Encyclopedia Brown, Nancy Drew and Agatha Christie for contributing to my growing love of mystery fiction. Also Harry Potter and The Lord of the Rings for making me realize that I actually do like fantasy and it is more accessible than I thought it would be. I loved Anne of Green Gables but it was the TV miniseries that really made me like the book and want to read it. I didn't read Pride & Prejudice till I watched the Colin Firth miniseries either but I love Jane Austen's novels. Persuasion is actually my favorite over P&P and I like Colonel Brandon from Sense and Sensibility more than Mr. Darcy (which definitely wasn't the case when I first read the books as a young 20 something). Thanks, Christina! I enjoyed Twilight when I read it many years ago, but I was already reading a lot of Sarah Dessen and historical fiction. But you are right...Twilight brought back many people to young adult literature, which is a good thing! I love Harry Potter and Lord of the Rings too--so sad I forgot them! I loved the Anne of Green Gables mini-series, too. I recently bought it! :) Thanks for visiting and I hope you have a great Thanksgiving! Haha. I know, right?! My thoughts exactly, Jenny. Have a great Thanksgiving! Such great selections, Christina! A Christmas Carol is DEFINITELY one of my holiday favorites; that story just never gets old. I feel pretty much the same way about Pride and Prejudice, too; I feel like I need to reread that one at least every couple of years - ha! Gone with the Wind is such a classic; I really need to reread that one; I haven't read it since I was a teenager and I think my perspective would be much different now. Thanks for sharing this great list! Thanks, Tara! Me too. I love ACC. Such a great holiday story....thanks for visiting and I hope you have a great Thanksgiving! Oliver is one of my favorite poets. I hope you can check her out. Thanks for visiting, Tori and I hope you have a great Thanksgiving as well. I'm definitely thankful for Outlander...and Jamie Fraser, lol. This is a wonderful list of books! Happy Thanksgiving! Haha. YES! I can't wait for the show to come back on. Thanks for visiting, Michelle. Happy Thanksgiving! Outlander is a book I will NEVER forget! Wonderful list! I agree....it definitely took me by surprise and is now one of my favorites. Thanks for visiting! Love your list Christina. 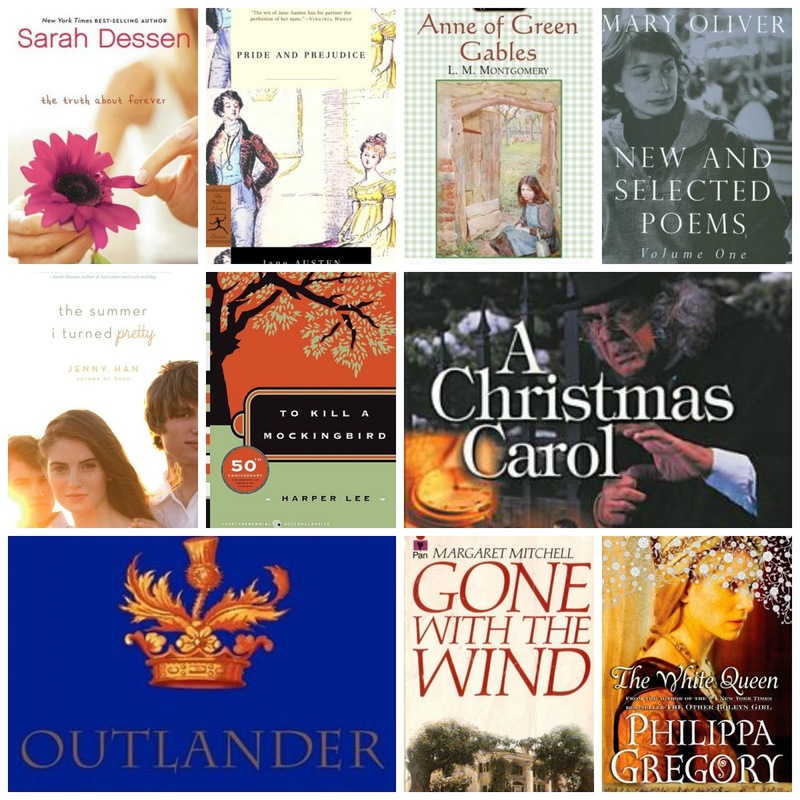 We share many of the same titles: Pride and Prejudice, To Kill a Mockingbird, Outlander and Gone with the Wind.